Services – Taylor Denture Clinic Ltd. Your smile is not the only thing affected by tooth loss. Physiological and psychological effects include speech problems, anxiety, difficulties chewing, and subsequent health concerns. At Taylor Denture Clinic, we understand the effects natural tooth loss can have on confidence and quality of life. We’re here to help. 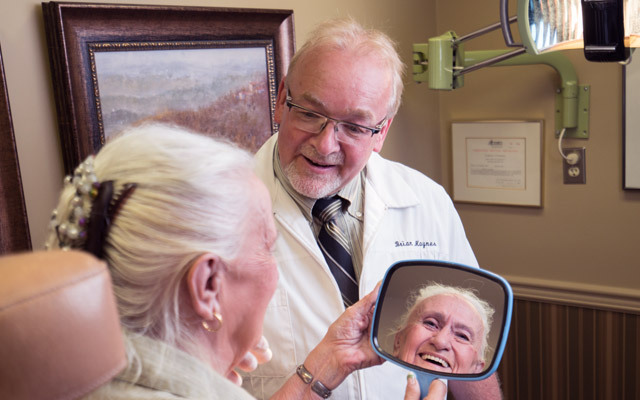 The Taylor Denture Clinic team carefully constructs each and every denture from precise, individualized impressions to provide you with a unique, serviceable, and custom-made appliance. Proper dentures should be comfortable, functional, supportive of the gums and mouth tissues, and look and feel natural. Read on to learn more about our complete suite of conventional and implant-supported denture services. 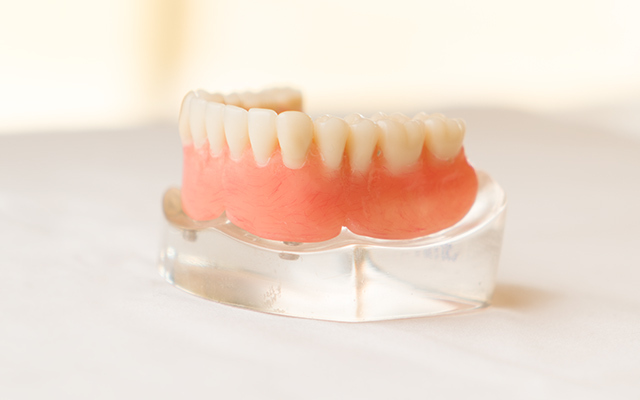 Complete dentures are removable dentures that replace all upper and/or lower natural teeth. Whether you are an initial denture patient or you’ve worn dentures for most of your adult life, we can replace existing dentures and fit new dentures in an efficient and timely fashion. 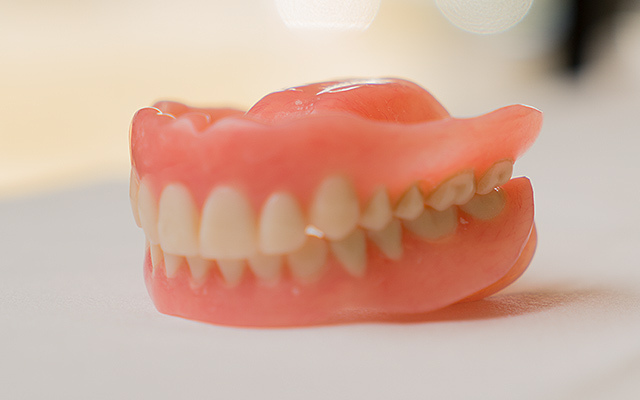 Initial denture patients must have all remaining teeth extracted and wait six to ten weeks before having dentures fitted, as this allows gum tissues time to heal. Don’t worry, if you would like your dentures right away we can fit you for immediate dentures. 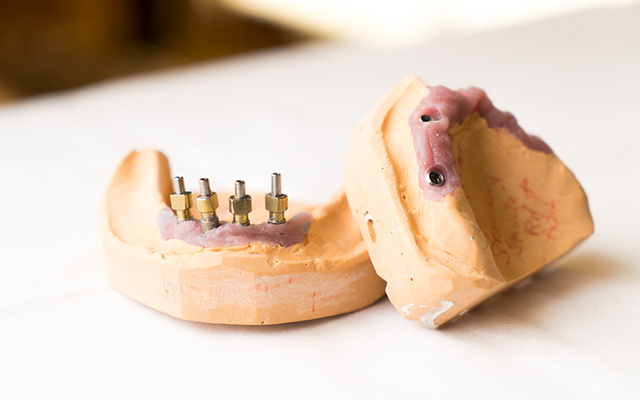 Full and partial immediate dentures differ from conventional dentures in two ways: impressions and denture construction take place prior to dental extraction, and the appliance is installed immediately following. The appliance, which also serves as a splint following extractions, has the added benefits of a consistent appearance and improved chewing ability. Although we go to great lengths to ensure the immediate denture has an accurate look and fit, bone resorption and shrinkage during the healing process (approximately six to ten weeks) is inevitable. Denture relines (available at an additional cost) are usually required to refit the immediate denture to the new ridge structure once resorption is complete. Patients who retain some natural teeth but are missing teeth in one or both arches are ideal candidates for partial dentures. Partial dentures are removable and prevent remaining teeth from shifting by filling in the gaps and maintaining proper occlusion. 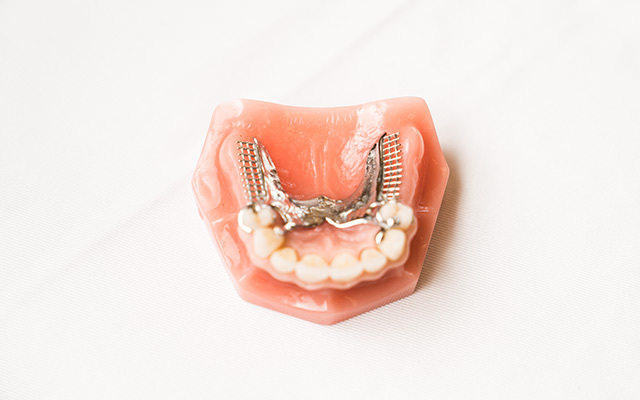 We prepare the majority of our partial dentures using a strong and durable cast metal framework. Our partial dentures are precisely constructed to provide peace of mind and ensure that your denture will blend seamlessly with your natural arch and teeth. The superior fit of implant-supported dentures make them an attractive and sought-after alternative to traditional dentures. Dental implants are titanium screws surgically implanted into the jaw to support dentures. Benefits include greater stability, improved bone preservation, and a more natural chewing and biting capacity. Different implant options are available depending on the physiology of the patient’s supporting bone structure. Patients who no longer have teeth but have sufficient bone to support implants are strong candidates for dental implants. Implant-supported dentures are available as full or partial dentures. Protect your teeth from sport-related injuries and overnight tooth grinding and clenching with our selection of customizable ProForm mouthguards and nightguards. ProForm mouthguards are a superior alternative to traditional bite-and-boil products, as they are moulded to fit your dental impression and offer optimal comfort and protection. Additionally, these mouthguards prevent against lacerations, reduce impact on jaw, mouth, and chin, and help wearers talk and breathe with ease. 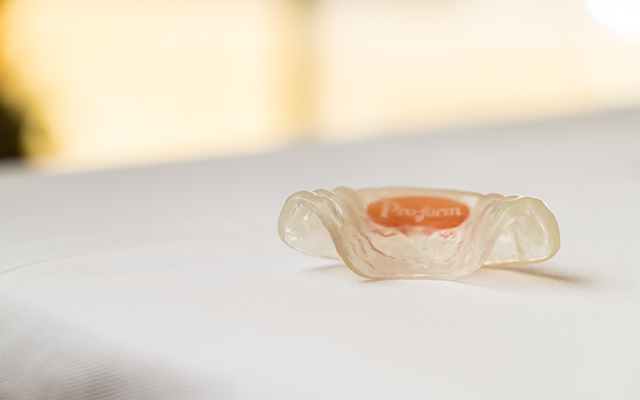 ProForm nightguards provide a more durable and comfortable alternative to over-the-counter nightguards. Wearing a nightguard will not only protect you against broken teeth and enamel loss, it is also proven to relieve pain, inflammation, headaches, and other symptoms of temporomandiblar joint disorder (TMJ) and Bruxism. Denture relines involve restoring the fitting surface—the part of the denture that touches your mouth—with a new acrylic base. A reline improves suction, comfort, and stability, and is a proactive measure to prevent having to replace a denture entirely. Aging, ridge resorption (shrinkage), tooth loss, and weight loss will cause your dentures to slip and shift over time; that’s why we recommend a denture reline every two to three years. Soft liners, on the other hand, are a porous, soft polymer material applied to the tissue-fitting surface of a denture. These are a good option for patients who experience continuing discomfort and gum pain, even after a denture has been properly fit and adjusted. Both relines and soft-liners are available for all dentures and are offered to you as a same-day service. Changes in fit, denture movement, droppage, and general wear and tear are but a few of the reasons you might seek a denture repair. No matter the reason, we understand how inconvenient and distressing a broken or damaged denture can be. When and where possible, we offer same-day denture repairs to reduce the impact of this disruption. If your denture is damaged or broken, please contact our office to schedule an appointment. On arrival, you’ll be greeted by a smiling member of our Taylor Denture Clinic team. From there, we’ll have you fill out a patient card detailing your dental history and any medical conditions you might have. We kindly ask all patients to arrive on time for their scheduled appointment. Your first appointment will take 15-30 minutes and covers everything from process to pricing. Based on your dental profile, Brian will present you with a recommended course of action. We will also take your dental impressions; this process is completely pain-free and takes between 5-7 minutes. During your second appointment, we take a second, more precise, set of impressions using a custom built tray. Using these trays enable us to measure an exact bite registration ensuring proper positioning in the mouth. During your 15-20 minute “try-in” appointment, the “try-in” is fitted in your mouth to assess the relationship of your bite and evaluate overall appearance. If you like the look of your dentures and Brian is comfortable from a technical standpoint, your next appointment will be your last. In the event you and/or Brian would like to make changes, we will schedule for an additional “try-in” appointment. After your “try-in,” Brian and Don will finish your dentures, making minor adjustments based on your feedback and technical specifications. 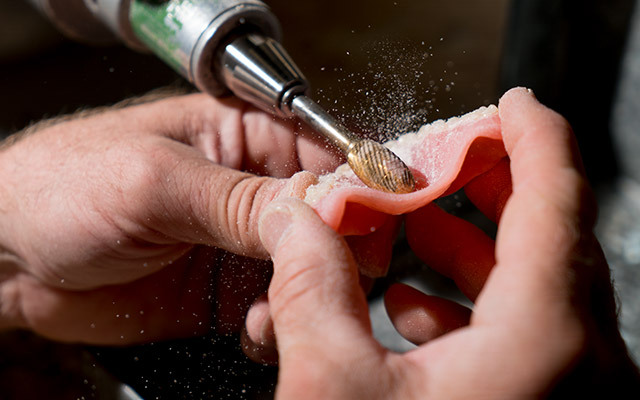 The “try-in” is used to create your finished denture through a casting process. During your final 15-minute appointment, Brian will present you with your new, completed dentures. Brian will check your bite profile and make minor adjustments as needed. If you feel additional adjustments are necessary after taking your dentures home, give us a call and we’ll book you for an adjustment appointment.